In a spanking new, richly-appointed research center above a busy shopping street in Tokyo's stylish Harajuku district, Hiroaki Kitano shows off his robot soccer team. In addition to Kitano's humanoid-robot work at Kitano Symbiotic Systems Project, a five-year, government-funded ERATO project, Kitano is the founder and chair of Robot World Cup Soccer (RoboCup), an annual soccer competition for robots. There are four classes of contestants: small, medium, simulated, and dog (using Sony's programmable robot dogs). 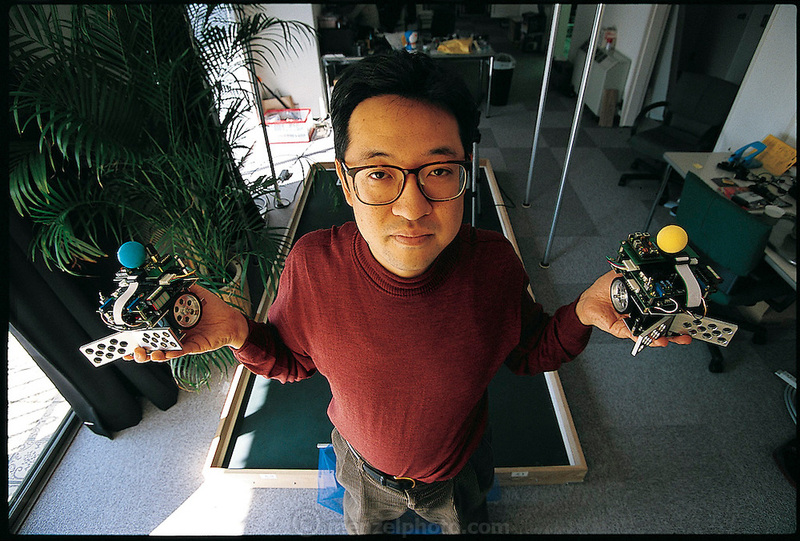 Kitano's small-class RoboCup team consists of five autonomous robots, which kick a golf ball around a field about the size of a ping-pong table. An overhead video camera feeds information about the location of the players to remote computers, which use the data to control the robots' offensive and defensive moves. Japan. From the book Robo sapiens: Evolution of a New Species, page 213 bottom.